In upstate New York about five hours northwest of New York City, the world's largest all-white deer herd roams free, or mostly free. These 200 or so deer evolved naturally within the confines of a 7,000-acre Army weapons depot that used to house the largest stockpile of nuclear weapons in the United States. Now, some 75 years since first being enclosed, the deer face an uncertain future as the decommissioned and overgrown expanse goes up for sale in mid-December, when a bus tour of the premises will be given for prospective buyers. The Seneca Army Depot, where the Seneca White Deer live among some 500 other regular brown-colored deer, is owned in large part by the Seneca County Industrial Development Agency (IDA). Once the U.S. Army Corps finishes cleaning up certain environmental hazards on the site they are expected to leave at the beginning of 2016. At that point the IDA plans to sell the land, with a tentative bid deadline of Feb. 29. According to the local Syracuse newspaper, nearby municipalities anticipate future development on the site will create new tax revenues. The area has been untaxed since World War II. As for the future of the white deer, Robert Aronson, executive director of the Seneca County IDA, recently said "we don't know." "Some buyers may decide to tear down the fence," he said. "Others may decide to keep the fence." A number of preservation groups, led by Seneca White Deer Inc. and the Nature Conservancy, hope to keep the mostly undeveloped landscape intact, deer and all. Dennis Money, leader of the Seneca White Deer nonprofit, has said his 18-year-old effort to save the white deer has "rounded the last corner, and now we're headed toward the finish line." Money believes the site could make a great tourist attraction, having told the Associated Press that people came from all over the United States to participate in the occasional bus tours of the site that he's given over the last decade. Money said that local farmers are also hoping to place a winning bid, which would have to be well into seven figures. He said their plans would include saving the deer herd along with setting up expansive dairy farms. He also said the nearby Amish community has expressed interest in partnering with Seneca White Deer to make an offer. The depot has provided protection to the white deer since 1941, when the 24-mile chain-link fence was completed. 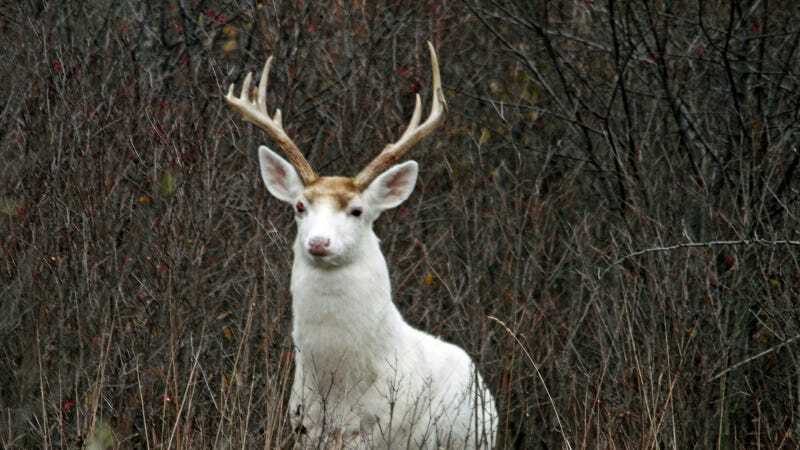 The white deer are not albino, but natural genetic variants known as leucistic, meaning they lack pigment only in their fur. If released into the wild, the white deer aren't expected to last long in substantial numbers as they make easy prey and their recessive genes will fade into the larger gene pool. The reason the white deer have been able to prosper within the fencing is due to their isolation from predators and hunters. According to Aronson, upkeep for the deer could cost as much as $500,000 a year, and include "managing the coyotes, managing beaver dams…snowplowing, wildlife management, lawn mowing and security." While the site has been fully devoid of weaponry since 2000, it does include some 140 miles of paved road, 40 miles of railroad tracks and over 500 bunkers that were used to store munitions. And finally, the question on everyone's mind: do the white fawns have white spots? Apparently they do, however they can be hard to discern against the white hair covering the rest of the fawn.